Retailer inventory management strategies are shifting to more of a lean approach, with the burden of holding inventory being pushed back to suppliers. 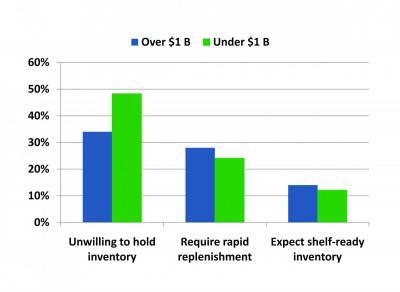 A recent survey asked 110 consumer goods logistics executives about the most challenging inventory requirement of their retail customers. The response: the expectation that the supplier would bear the burden of holding inventory. Download the complete report on this Auburn University survey: Key Supply Chain Challenges of Mid-Sized CPG Companies. Mid-sized companies seem particularly sensitive to the shift by retailers to lean inventory management strategies. Close to 50% of these smaller suppliers cited this as their number one challenge among all retailer requirements, versus just 33% for larger consumer goods companies. Process improvement via systems investments. Suppliers say systems are the key to translating data into accurate forecasts. But they express frustration over an inability to receive timely data from retail customers. Collaboration with retailers. Suppliers say working with retailers to establish reasonable order minimums and agreeable replenishment practices is a win-win for both parties. Working with capable 3PLs. Suppliers say they are using the knowledge and infrastructure developed by 3PL providers to help them comply with these changing retailer inventory management strategies. Download the full Auburn University report.